Frederic H. Fahey, DSc, FSNMMI, and S. Ted Treves, MD, accepted the 2017 Butterfly Award on behalf of the Image Gently Nuclear Medicine Working Group at the recent Image Gently Alliance meeting in Chicago, Illinois. 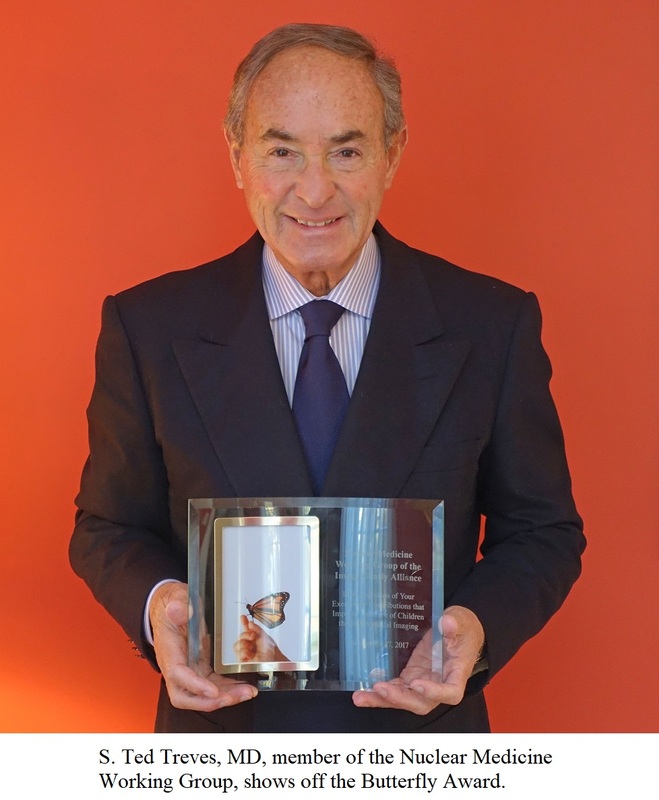 Each year, the Image Gently Alliance Steering committee selects the recipient(s) of the annual Butterfly Award based upon contributions that embody the mission of the Alliance to improve safe and effective imaging care of children worldwide through advocacy. The Nuclear Medicine Working Group, chaired by S. Ted Treves, MD, is an international body of experts that emphasizes the importance of nuclear imaging in the care of children and provides resources for the safe performance of procedures with the lowest radiation dose needed to achieve image quality. The other members of the group are S. James Adelstein, MD, PhD, FSNMMI; Adam Alessio, PhD; Zvi Bar-Sever, MD; Ronald Boellaard, PhD; Wesley E. Bolch, PhD; Lise Borgwardt, MD; Arturo Chiti, MD; Dominique Delbeke, MD, PhD, FSNMMI; Eric C. Frey, PhD; Michael J. Gelfand, MD, FSNMMI; Marilyn J. Goske, MD; Frederick D. Grant, MD; Neha Kwatra, MD; Michael Lassmann, PhD; Helen R. Nadel, MD; Marguerite T. Parisi, MD; T. Pfluger, MD; George Sgouros, PhD; Stephanie Spottswood, MD; and Michael G. Stabin, PhD. The Nuclear Medicine Working Group has developed consensus guidelines on the imaging of children, and these guidelines are reviewed and updated regularly. The 2011 Go with the Guidelines Image Gently Campaign for Nuclear Medicine and subsequent efforts have been effective. In one recent survey (J Nucl Med, 2016) of nearly 200 U.S. general hospitals, 85 percent said they were familiar with Image Gently, and 58 percent of these knew about the North American consensus guidelines, which resulted in changes in practice for pediatric patients at a majority of them. The Working Group is now focusing on analytic, evidence-based approaches. They are refining current guidelines, evaluating elements of image quality, improving dose optimization through guidelines for computed tomography in hybrid imaging, and evaluating radiopharmaceutical doses in PET/MRI. Congratulations to the Nuclear Medicine Working Group for its efforts to improve the radionuclide imaging of children through the right dose, given the right way to the right patient at the right time!